It is has been several months since our last readers' poll. Since there are so many more of you reading our blog these days, we'd like to get to a know a little bit about you. Please see the poll on the left side of the page. We'd appreciate it if you could take a moment to choose one of the answers. We'll be back to more info about teething tomorrow. Thanks! The Truth about Teething Part I: Is it Teething or Something Else? Most parents dread their infants' teething. They anticipate sleepless nights and inconsolable crying. Parents have attributed dozens of symptoms to teething including drooling, biting, fever, runny nose, congestion, ear problems, diarrhea, skin rash, and vomiting. But what if some or all of those symptoms are not part of teething? In this post, we'll take a closer look at what parents believe about teething versus what the research tells us. Teething is more formally called "tooth eruption" and occurs as infant teeth move from the jaw through the gums and become visible in the baby's mouth. While all babies are different (as we always say), babies teeth typically start showing up when the baby is about 6 or 7 months old. Most often, the first teeth to appear are in the lower front of the mouth and a full set of baby teeth may take two years to emerge. Teething, therefore, goes on for many months. Of course, those of you who are already parents know that! While researchers associated biting, thumb sucking, and drooling with teething 30 or 40 years ago, today's parents have expanded their ideas about teething to include a wide range of concerns. In an interesting study published in Pediatrics in 2000, researchers followed a group of children aged 6 to 24 months that attended childcare settings. Each weekday, they asked parents and childcare providers about symptoms commonly believed to be associated with teething. The children's mouths were examined daily by a professional to see if any teeth had appeared. The concept was to identify which symptoms were associated with teething and which were not. What did they find? Virtually none of the common symptoms assumed by parents to be related to teething was statistically associated with tooth eruption. Interestingly, when the parents who participated in the study were asked about their children's teething symptoms, they reported many of the common symptoms even though their own records didn't support the connection. Other studies also support the view that parents are likely to assume that many symptoms of illnesses (like colds and ear infections) are related to teething. Clinicians and researchers are concerned that some parents might dismiss symptoms of more serious conditions (like ear infections) as teething and delay taking their babies to the doctor. Other parents might give medications to babies unnecessarily either for a few days or a few weeks. Another interesting finding is that parents in the studies often "diagnosed" teething by the symptoms rather than by tooth appearance. Young babies' behavior can be very confusing. Babies also end up catching many minor illnesses during the months in which teeth typically appear. Parents, struggling to understand what is happening with their babies may decide that "teething" must be the reason for their babies' runny noses, skin rashes, and fevers but they are likely to be wrong. Each baby will experience teething in his or her own way but the research indicates that most of the symptoms related to tooth eruption are mild and short-term. We'll talk more next time about what parents might do to "treat" their babies' teething and whether or not these "treatments" work. Next time: The Truth about Teething Part II: Can Parents Make Teething Easier for Babies? Coming up this week, we'll share a short series of posts about teething. We'll take a closer look at the facts versus fiction surrounding this universal parenting challenge. Stay tuned! 1. What percentage of total time sleeping do newborns spend in active sleep (dreaming)? ANSWER: 70-75%. Active sleep is the time when dreaming occurs. Newborn babies spend so much time in active sleep because the brain activity related to dreaming is important for babies' development. For more information about newborn sleep, read Part 1 of our recent series The Science of Infant Sleep. 2. 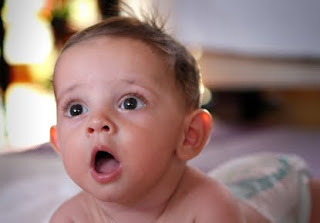 Around 18 months, babies tend to have a vocabulary "spurt." 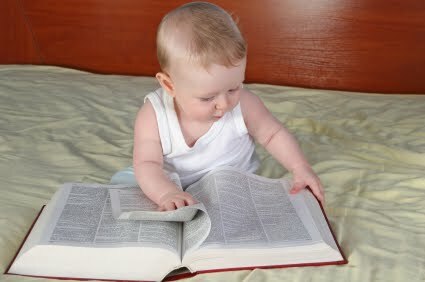 About how many words does the average 18-month-old learn per day? ANSWER: 3. It is amazing how quickly babies learn! For more information about language development during the second year of life, refer to Part 2 of the From Cues to Conversation series. 3. 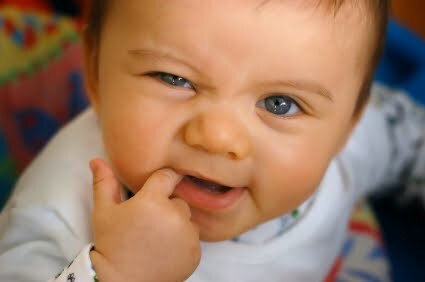 On average, how old are babies when they cut their first tooth? ANSWER: 4 to 7 months. Teething is one part of life that is uncomfortable for everyone. It is physically painful for babies and emotionally painful for parents. Unfortunately, there is wide variation not only in the age at which the first tooth appears, but also in the amount of time it takes for teeth to cut through. In one of our upcoming posts, we will explain how babies' behaviors may change during teething and provide tips for making the experience a little easier on everyone. 4. Babies are born with all 5 senses (sight, hearing, taste, touch, and smell). Which of the 5 senses seems to be the least developed at birth? ANSWER: Sight. 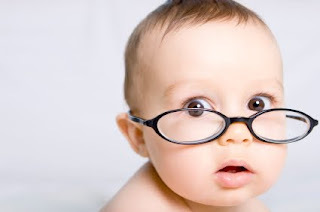 When babies are born, they can only see objects that are 8-12 inches away. The other senses are much more developed. For example, a baby learns the sound of his mother's voice before he is born and can distinguish the smell of his mother within days after birth. For more information about newborn development, refer to the post Newborn Development: Reflexes Rule! 5. On average, how old is a baby who can sit all by himself and move a toy from one hand to the other? ANSWER: 6 months. Babies usually begin learning to sit with support around 4 or 5 months of age. At this age, they also start trying to transfer objects from one hand to the other. After just a few months of practice, typically around 6 months of age, these skills become routine! Remember that all babies develop at their own pace and these ages are just averages. More information about infant development is available in the Infant Development series we posted last September and October. So, how'd you do? We'd love to hear from you, so send us your comments. We'd also love to use one of your questions in our next quiz, so send those too! Next time: Back to your questions! Recently, we've had several questions that don't require long explanations. In this post, we'll respond to several of these questions at once. We've paraphrased the questions to make them a bit shorter. 1. What is a nursing strike? A "nursing strike" often refers to older babies' refusal to breastfeed by turning or pushing away from mom and refusing to latch. Some mothers might interpret a "nursing strike" to mean that their babies want to quit breastfeeding. This can be very disappointing for moms who haven't yet reached their breastfeeding goals. Nearly all older babies will refuse to breastfeed occasionally, but most will return to breastfeeding fairly quickly. It is common for babies to turn and even arch away from moms when they are using disengagement cues. If they are distracted or disturbed by loud noises, over stimulation, illness or discomfort, babies may use disengagement cues to let their moms know that they need something to change before they feed. Remember, babies can't be specific about what is bothering them. It is up to parents to figure out what might be wrong. If mothers ignore these early cues, babies will escalate the cues and may start to fuss or cry. When hungry babies refuse to feed, it is important to look around the environment and reduce distractions or help babies feel more comfortable before trying to feed them. 2. Why does my baby like squeaky toys? Babies' sense of hearing is well developed at birth and most babies love repetitive sounds. They like music with repeating melodies and toys that repeat sounds over and over. Squeaky toys can be particularly fun because they are associated in babies' minds with games they've played with mom or dad or with their own ability to predict the noises the toys can make. Babies love to anticipate experiences and events and will squeal with glee whenever they are able to predict the end of a game, like peek-a-boo, or the result of an action like squeezing a toy. See our earlier post to read more about why babies are so happy when their predictions come true. 3. Is it ok for a 5-month-old who can roll over on his own to sleep on his tummy? As long as your baby's sleeping place is safe (e.g. firm surface and free of heavy bedding, stuffed animals, or anything that could trap your baby) babies who can roll over on their own do not have to be returned to their backs if they rollover from back to tummy during the night. However, it is best that all babies be put down to sleep on their backs no matter what they do when you turn out the light. Next time: More reader questions and we'll introduce a new series! It's time for another Baby Quiz! Read the following questions and send us a comment with your answers. We'll post our answers early next week. 1. What percentage of total time sleeping do newborns spend in active sleep (dreaming)? Check back next week to see the answers! We're excited, and maybe a little overwhelmed, to see that our blog had 5000 readers this last month! We welcome all of our new readers and hope that you will take the time to ask us some questions. If you are new to the blog, we encourage you to read the first 4 posts from last June (2009) and then explore the keywords on the left to find other topics that interest you. There is still so much to share! Please let us know what topics you want us to cover next! Next time: A New Baby Quiz! As we wrap up this multi-part series on infant sleep, we return to some of the original questions that led us to focus on this all important area. Several of you asked us about the popular recommendation to make sure that your baby is still partially awake when you put him in his crib. Others wanted to know why babies sleep through the night once or for several weeks and then start waking again. In this post, we'll revisit the interrelationships that we talked about in the last post, but this time, we'll discuss specifically how they may affect your baby's abilities to fall asleep and then stay asleep. I'm a big baseball fan (now stay with me, there is a point). One of the things I really love about baseball is that with every new batter, new pitcher, and new situation, the game changes. Baby sleep is a lot like that. Babies' sleep location, their own physical and developmental characteristics, and their parents' behaviors, all interact to influence infants' sleep. And, the game keeps changing as babies grow, as parents change, and when babies sleep in different places. I wish I could give you the answer to get babies to sleep quickly and for long stretches but I continue to believe that there is no single intervention that will help all babies, or even the same baby over time, in all circumstances. Now, I don't mean to imply that there is nothing parents can do. Instead, parents should think of themselves more like the baseball batter adjusting to the pitches that are thrown to them. Some adjustments in parents' actions and in babies' environments will help babies fall asleep, others might help babies stay asleep. Believe it or not, there is a technical term for the time it takes to fall asleep, it's called "sleep-onset latency." Most newborns fall asleep while feeding (but they wake and feed frequently!) so falling asleep becomes more of a problem for older infants, especially those who hate being drowsy. Caffeine exposure and over stimulation can be important factors that might hinder babies' ability to fall asleep. Babies who are sick or uncomfortable (as with teething) will also have problems falling asleep. Dealing with these issues (with help as needed from the doctor) can be a big help to tired parents. But, there are other babies who don't want to fall asleep even when they are not sick or overstimulated. The research we found indicates that consistent bedtime routines (lasting from 20 to 40 minutes) can help babies to wind down. Some routines include a bath, a massage, some rocking, and a story or a song. The key is for parents to be consistent with a series of pleasant and soothing activities night after night. One large study found that a routine helped babies fall asleep faster and stay asleep longer with or without putting the babies down slightly awake. Let's get back to the "put your baby down while awake" recommendation. This suggestion is used primarily as a way to prevent babies from calling out for their caregivers if they wake at night. The idea is that babies who always fall asleep in their parents' arms won't be able to fall asleep any other way. We found several "observational" studies that found that babies who were put down awake were more likely to stay asleep. In observational studies, researchers look at things the way they are and they don't try to change anything as they do in "intervention" studies. Because the same babies who accept being put down awake may sleep longer naturally than those who fight sleep, the relationship between the slightly awake baby and longer sleep may be related more to the baby's characteristics rather than the action of putting the baby down awake. So, we need intervention studies to see if the action results in longer sleep for all babies. This is where it gets tricky. There are plenty of intervention studies that include putting babies down while they are awake but none that includes only this one action (for infants). Most of the interventions include 1) education for parents about infant sleep, 2) standardized bedtime routines, 3) putting baby down at the end of the routine awake or not, and 4) changing parents' response if the baby protests going to sleep. Some of the interventions included instructions for parents to wait to respond (letting the baby cry). In other studies, parents were told to respond by touching the baby (like putting a hand on the baby's back) but not picking the baby up. Some interventions also included white noise, music, and other changes to the sleep environment. Ok, that's a lot to take in. What does this all mean to you, a tired parent? We'd like to end this series with a few key messages. Newborns need to wake for many reasons. Get some help for this tough time. A single intervention is not likely to increase sleep for all babies or permanently for any baby. When trying to help your baby go to sleep faster and sleep longer, you need to consider his health, age, size and developmental characteristics, your own actions and beliefs, and characteristics of his sleep environment. How a baby sleeps is not an indicator of parenting skill. There are a lot of options for parents of older babies to get more sleep. Understanding more about how babies sleep, why they wake, and how "the game changes" over time can help you make informed decisions about what steps will work best for you. In this series, we've been sharing information about how and why infants' sleep patterns change as they grow. In this post, we'll focus on the how characteristics of babies, parents, and sleep environments interact to influence how infants sleep. In other posts, we've talked about why a "one size fits all" sleep intervention is not likely to work for all babies. That's because there is no one reason why babies sleep the way they do. Their own bodies and abilities, how and when they are cared for, and where they sleep, all work together to help or hinder babies' sleep. Parents need to keep this bigger picture in mind. While parents can and do shape many of their babies' behaviors, babies come into the world as unique human beings with combinations of traits all their own. Your baby's sleep patterns will be affected by her age, health, physiology (like her ability to make and respond to hormones), exposure to medications or stimulants (like caffeine), her development, stomach capacity, day time activity level, feeding pattern, intake, temperament, and sensitivity to the environment. Each of these factors can influence her sleep patterns differently. Parents and other caregivers are, of course, as unique as their babies. Some important characteristics that may influence infant sleep include parents' own physical and emotional health, cultural and family experiences, sensitivities to baby behaviors, and infant feeding practices. Most of these factors affect babies' sleep because they have powerful influences on parents' day and night time infant care behaviors. Babies' sleep patterns may also be influenced by their physical environment. Sounds, sights (like lights from a TV), movement, comfort, and temperature of the places where babies sleep all make a difference for sensitive babies. These factors affect babies differently depending on whether they are in a lighter (active) or deeper (quiet) state of sleep and babies' bodies influence how long they stay in each type of sleep. All this means that babies' sleep patterns emerge when all of these factors come together, like puzzle pieces. We can't always predict what babies will do. For example, older babies with bigger stomachs may wake when they are sick, teething, or sleeping in a room that is too hot or cold even after they have slept for longer stretches for awhile. City-dwelling younger babies may stay asleep despite loud noises and lights because their bodies have adapted to what goes on around them. Parents' interactions can make a difference too. Parents checking on babies in active sleep might inadvertently wake their babies or babies might sleep longer at night for parents who make sure that their babies have lots of daytime activity. But parent interactions can only go so far if babies bodies are not ready to sleep longer or they are sleeping in an unfamiliar environment (like grandma's house). Next time, we'll wrap up this series and talk about what all this means for tired parents, how sleep patterns change in older babies, and the research we found about putting babies down partially awake. The first 6 weeks are finally over! New parents, give yourselves a big "high five!" You are probably noticing that things already seem a little easier. At least, you are more familiar with your babies’ needs and cues and likely to be getting a little more sleep than you were at first. In this post, we’ll share information about some of the changes your baby will go through from 6 to 16 weeks and how these changes might affect how your baby sleeps. While you’ve been waking up several times at night to feed, diaper, and console your baby, his little body has been going through a lot of development. His body and his tummy have grown and expanded, allowing him to take in more at each feed. He still falls asleep dreaming (remember to look for those eye movements and body twitches), but he spends less and less time in the “active sleep” state after he falls asleep. That means that you won’t have to wait so long to put him down if he is sensitive to position changes when he is dreaming. Just a few minutes should do it! His body also has started to make and use hormones like melatonin and cortisol to help him develop and follow his own circadian rhythms. When he is sleeping, you’ll notice that your baby won't move as much or make as many little noises as he did when he was younger. You probably won't find swaddling to be useful anymore and you will be less likely to be awakened by his quieter late-night stirrings. He’ll start to sleep longer stretches and concentrate that sleep at night but be prepared to get up with him, because he still will be likely to need a nighttime feeding or two. While all babies wake frequently in the first 6 weeks, some babies start sleeping longer (5 to 6 hours) by the time they are 3 months old; others do not. This period of transition can be very confusing because 3-month-old babies sometimes sleep for longer periods and parents may assume that their babies should always sleep that way. Your baby will show progress toward sleeping longer stretches, but this progress is often of the “one step forward, two steps back” variety as babies hit growth spurts or have other reasons for waking. Around 3 months, parents will start getting pressure from family, friends, and even strangers suggesting that “it’s about time” that their babies should sleep through the night even though most babies don't do so consistently until much later. Big changes happen as babies get closer to 4 months of age. Most babies start falling asleep in quiet sleep (like their parents) by the time they reach 4 months. This means that they will drift off and stay asleep even when put down right away for nap or nighttime. Babies will also be working hard at developing their “self-soothing” abilities both when they are awake, like sucking on their fingers when they are upset, and at night, by going back to sleep without crying when they wake for a few moments during the night. As with any aspect of being human, there is a great deal of variation in babies’ self soothing skills. Some parents of 4-month-olds are relieved to be sleeping for much longer stretches and other parents with waking babies are wondering what they are "doing wrong." By 4 months, the pressure is really on to reach the ultimate parenting nirvana of sleeping through the night. Sleep-deprived parents will adopt a wide range of strategies to get more sleep including the use of sleep training methods, co-sleeping, feeding strategies (like weaning from the breast or adding cereal to baby’s bottle against the doctors’ advice), or tag-team efforts for nighttime care. Many parents are willing to try nearly anything to get more rest. Some parents seek advice from parents who claim to have “good sleepers,” hoping to find some answers. Others find that they get advice from everyone whether they want it or not. We have already learned how passionate folks can be about their efforts to get babies to sleep longer. Rather than making any attempt to prescribe the “best way” to get babies to sleep more like their parents, we’ll share (next time) what science tells us about how baby and family characteristics interact to contribute to differences in how babies sleep.